In 16 days I will have two preschoolers, a middle schooler, and a high schooler. That means lots of papers coming home, lots of events to keep straight, and lots of Box Tops to send to two different schools. Without a game plan, everything starts piling up after the first day of school. Today I’m sharing a few tips on keeping school stuff separate so you can stay organized, as well as how to build Ro-Box Top to make collecting Box Tops fun! There are a few things I’ve been doing to keep things separate for my oldest two kids. Now that all four will be in school, I just have to double up my system and I’m golden. Here are some ways I keep all that stuff from school in order. One designated drop location for all school paperwork, that you go through each night. File Folders for each child’s paperwork that needs to be kept for the year. One magnet per child on the fridge for displaying artwork. Small tote for each child to store school year mementos, awards, etc. Color coded calendar for activities. Now, let’s talk about the awesome Ro-Box Top, who came to life after my crafty light bulb went off while shopping at Walmart the other night. I needed to pick up the last of our school supplies and paper goods for each of the kid’s classrooms. I’m always stocking up for home use, but we also love to stock up for school. 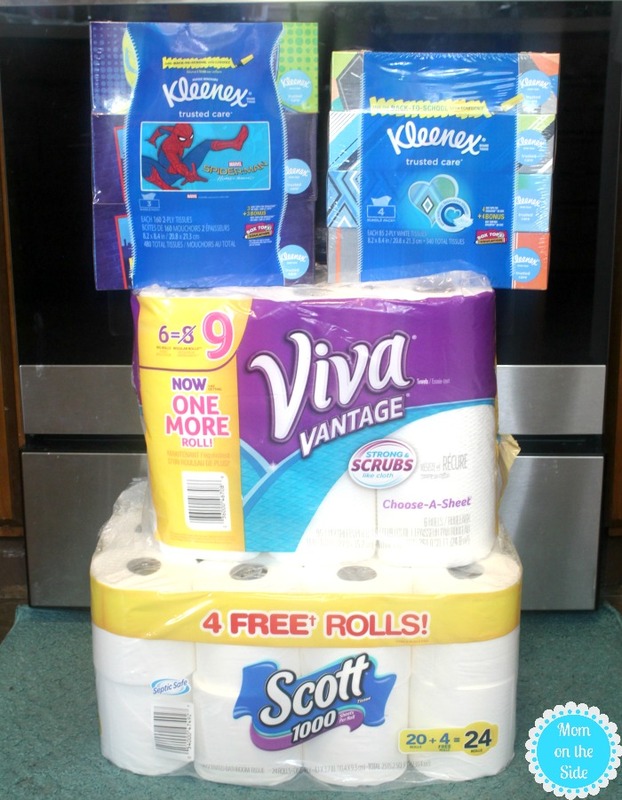 Being able to buy bundles like Kleenex® Trusted Care* 3 Bundle Pack and 4 Bundle Packs, Scott® Tissue 20 Roll Pack, and Viva® Vantage® 6 Big Rolls makes that easy. 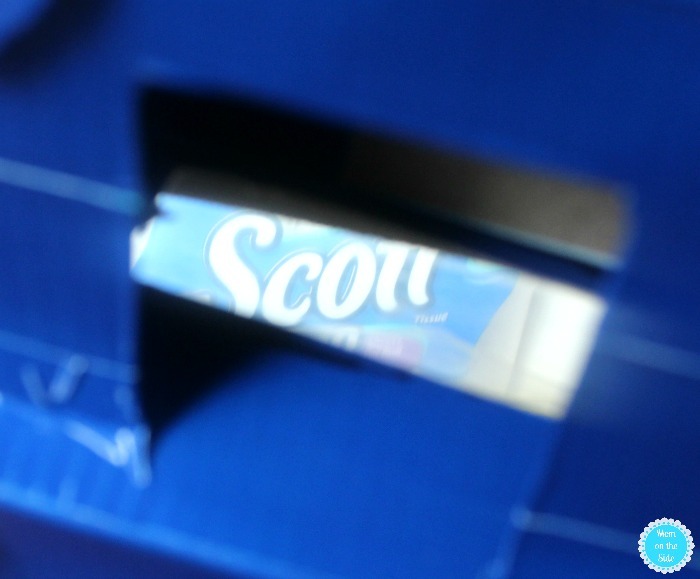 When I tossed them in the cart I spotted double Box Tops on the packaging and that’s when the idea started swirling. Ro-Box Top!! 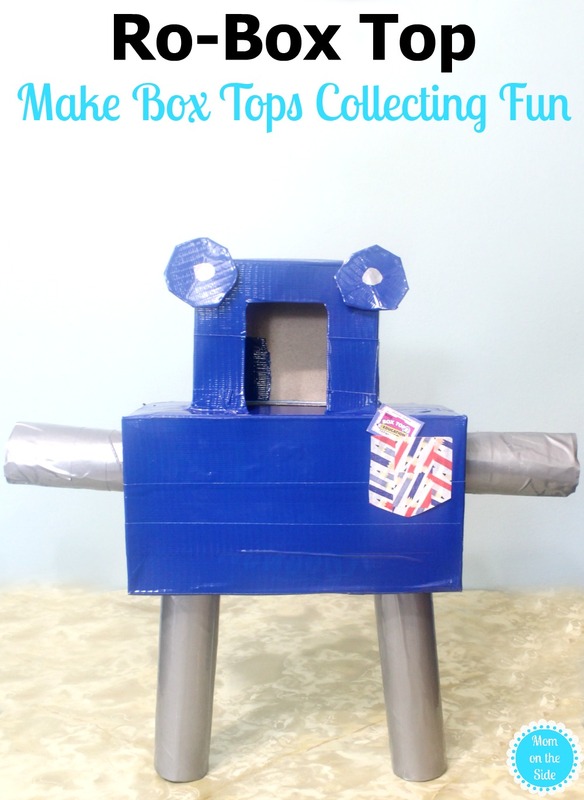 I like to make Box Tops collecting fun, and Ro-Box Top will help me do that this year. Not only can you find double Box Tops on Kleenex® Facial Tissues right now, but they are also fun for crafting when empty! Perfect for making a Ro-Box Top the kids can “feed” Box Tops to each night. When his “belly” gets full they can turn them in at school. Oh, they are going to love this! First, cover one Kleenex® box in tape. Cover it all the way around, but leave open the hole where the tissues would normally come out. This gives you easy access to remove Box Tops when it’s time to turn them in. 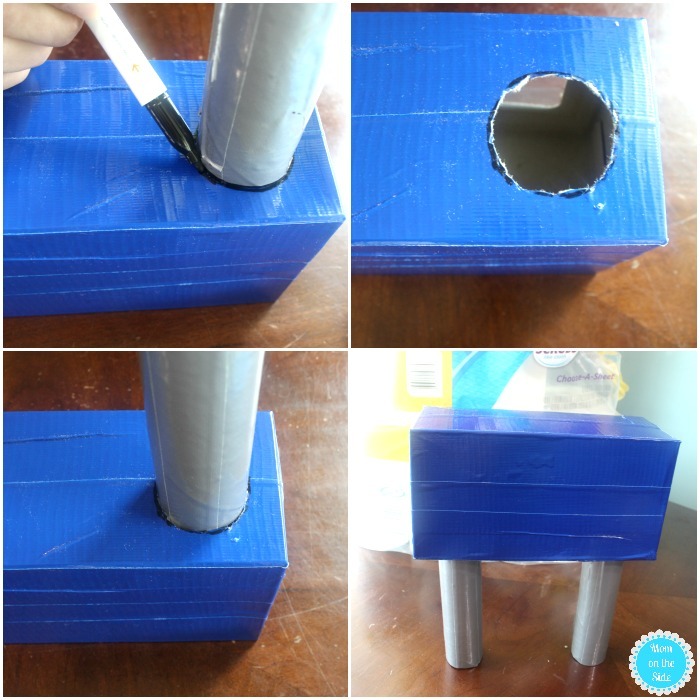 Next cover the paper towel and toilet paper tubes with tape. 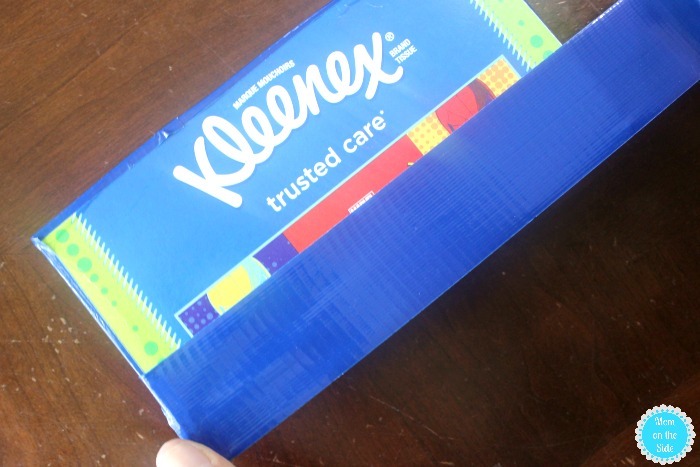 You can use the same color on the Kleenex® box, or change things up. We went with blue for the body, and silver for the legs and arms. 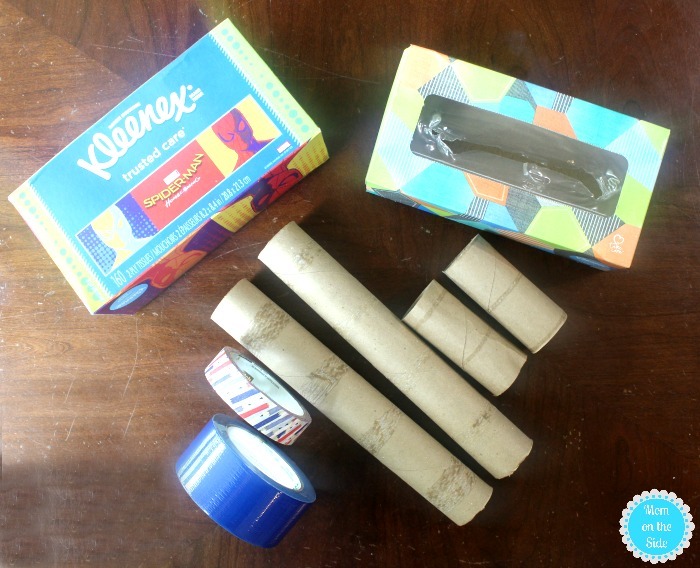 Once you’ve covered all the tubes, trace the hole onto the Kleenex® box and cut out holes to stick each tube in for arms and legs. Now it’s time to work on the head of Ro-Box Top. 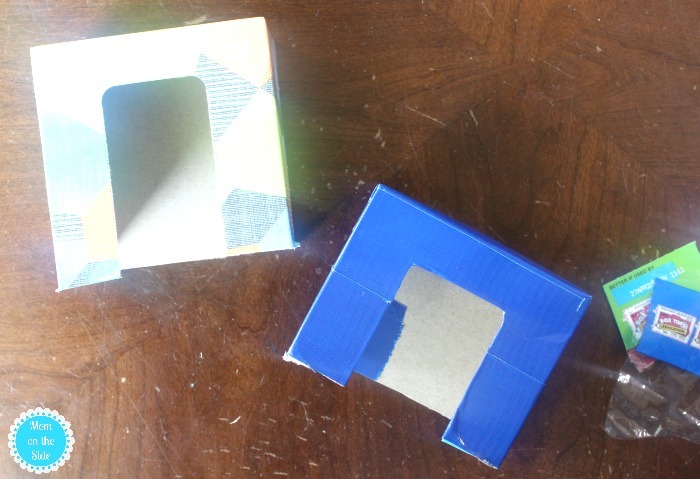 Cut a Kleenex® box in half, and cover one-half with tape. Leave the hole open, as this will be the mouth of Ro-Box Top and where Box Tops are inserted. Before attaching the head to the body with tape cut a hole in the top of the body. This way, when the Box Tops are stuck in the mouth, they will fall down into the belly. 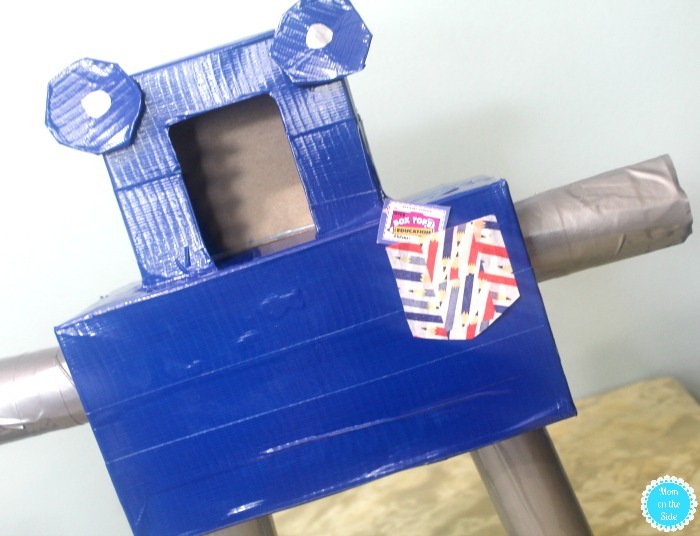 You can decorate your Ro-Box Top with eyes, clothes, shoes, or leave him just as he is. My husband added eyes, and I added a little pocket made with tape. I’m sure he will be wearing all sorts of jewelry and hats when Miss Charlie gets a hold of him. Ro-Box Top helps me keep things separate so two of the schools my kids go to can take advantage of the program. The Box Tops in Ro-Box Top go to the elementary school, and all the Box Tops from grandma go with my son to the middle school. Between the two schools, they’ve earned over $10,000 from Box Tops for Education and my kids to continue their excitement for such a great program! Now we have Ro-Box Top to help us with our collecting throughout the year, and we helped stock up the preschool classroom with necessities. 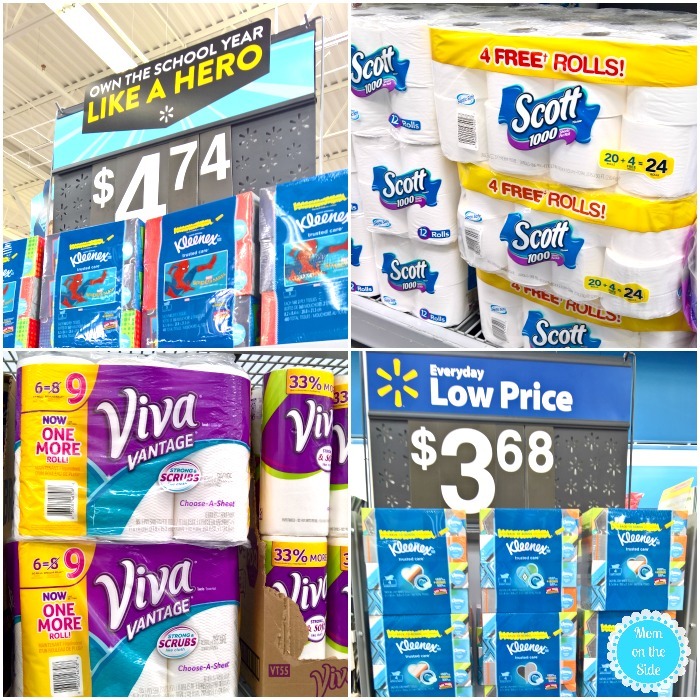 Look for double Box Tops at Walmart, and stock up for back to school with Kleenex®, Scott® and Viva® products! They are already on our back to school shopping list, so let’s be heroes AND save! Learn more about Double Box Tops at Walmart and earn cash for your school!